…of my 2011 target of 300 miles that I set way back at the start of the year! When I hit 300, I’m treating myself to a new pair of shoes because these babies will have had at least 450 miles on them. So what do I choose? Probably the same as what I have now (Asics GT 2150), although I am so tempted to get something like the Nike Free and try some close to barefoot running. Whatever I get, you’ll be the first to know. Possibly even before my husband does! This morning I decided that I would take Murphy hound through the woods for a quick 3 mile trail run before work. After a summer of churned up trails and huge timber lorries trundling past me it was great to see that the warning signs had been removed meaning they had finished working the forest. Not that I’m complaining about them working the area; as they had heavy equipment they had to make sure that the tracks were well maintained and they’ve left behind some graded roads where the ground used to hold any rainfall and turn to mud. After yesterday’s rain I was expecting to see mush, so imagine my joy at running across gravel! I had a not so good 3 miles on Sunday. I think I was hattered trying to fit everything into a busy day and maybe wasn’t in the best frame of mind for running. I ran far too fast too soon and paid the price. Today I was happy and relaxed and ready to run a steady pace. I can never match my road running pace off road. Imagine my surprise, on hearing my 1 mile time announced, that I was running slightly faster than I was on Sunday. Maybe running relaxed is the answer; if I try to run fast I just get all tight and wound up! Dismiss the thought and there’s the pace I want! I managed one mile in 11 minutes, pretty good for me off-road. Just as I had been getting ready to set off (unhooking the dog from his lead, putting the lead across me, checking I still had his “sweets” to ensure that I wouldn’t be chasing after him to come back when we’d finished and starting my tracking app) a guy ran out of the woods with his Collie. He would have been in his 70s I guess. We shouted greetings to each other and went off in opposite directions. As I hit 1 mile I realised that he had done one of my 3 mile routes as I met him joining my trail. I followed him for a while (catching him up too!) before I went down one of the new trails created by the logging trucks. It’s been a long time since I’ve managed to get a 3 mile run out of the woods and getting to 1.5 miles was a great feeling. I hit 2 miles in just over 21 minutes, still maintaining a good off-road pace. Coming back is always tough. From my house I’m largely running downhill towards the shore; going home inevitably I’m running uphill all the way back! I struggled a bit to maintain my pace, but maintain it I did. I hit 3 miles in just over 33 minutes and that was with 1 minutes walk breaks every 4 minutes. That more than makes up for Sunday’s run! An off-road 3.1 miles in 34 minutes is pretty good for me. I’ll take that, especially with next week’s 10k road race looming. And the motto for today? Thanks to good ol’ Aesop it is “Slow and steady wins the race“. Remind me of that next week please!!! I seem to be getting into the habit of posting weekly at the moment and usually after my long run. Well here I am again. After my longest run ever (LRE) last weekend I spent the next few days in relative luxury celebrating my birthday in the English Lake District. The hotel we stayed at had a spa complete with pool, jacuzzi and a GYM! How sad is it that I was excited to see a small cluster of gym equipment nestled in a room outside of the pool?! Very sad indeed; only other obsessives would share my glee! You know who you are! I tried everything bar the treadmill. Like a kid in a sweetie shop! As I was really just keeping Grant company I had a short blast on each of the other machines; 15 minutes on the cross-trainer, 5 on rowing machine and 10 minutes on the bike. All good fun, especially the rowing machine. I think I might have been a Viking in a former life the way I was getting into it. I’m glad that Grant had his back to me otherwise I might have been renamed Helga! Since then I’ve had a week of shorter runs pacing and accompanying Grant on his 5k training programme. He’s doing really well and it takes me back to just over a year ago when I was doing the same thing. Each longer run asked for that extra bit of effort than you thought would kill you. Now I run happily alongside him at ease, not really challenging myself and hardly out of breath. I know that irks him, but he’ll be the same in a few months. It’s hard to believe just how much I’ve changed from the huffing puffing overweight asthmatic I was a year ago! He’s at the stage of doing one 20 minute run a week. It was a tough step up from his longest run being 8 minutes and we took a walk break half way. I was disappointed that the GPS broke down and I couldn’t tell him how far he’d covered, but thank Crunchie for Google Maps! Today was meant to be my long run for the week. Next Sunday I was meant to do 9.5 miles, but as I have a 10k race on the Tuesday afterwards I didn’t think that was a good idea. So today I combined a 3 mile faster paced run on my own with a slower paced 2½ miles with Grant. 5½ miles would have to do. Call it tapering! My 3 miles were quite hard. It’s a very windy day here and, living so close to the coast, the wind comes straight off the sea with nothing to stop it. Whichever way I went, the wind seemed to be in my face. I took too many walk breaks which surprised me as when I was doing my 13k/8 miles I stuck religiously to my 4:1 ratio without any difficulty at all, albeit at a slower pace. I was running fast today though, maybe too fast and it knocked the puff out of me. I started off running 8½ minute miles, but these levelled out to 9 – 10 minute miles. I wish I could stop myself from starting off too fast! If anything that it my greatest difficulty. I can run all day at a steady pace, but suggest a short distance and I go crazy. By the time I arrived home (elegantly sprinting along the road I live on, past any neighbours who might be looking!) I was tired, hot and knew I’d run hard. It was a reasonable run in the circumstances. I never do well running into a headwind, but it’s a great training tool! Two minute turnaround and I was out again with Grant doing a 5 minute warm up walk, 5 minute run, 3 minute walk, 8 minute run, 3 minute walk, 5 minute run and a 5 minute cool down. It actually felt pretty good. On the last run I was aching to sprint off, but I could see that my husband was tired and didn’t want to irk him further! Me being able to run 3 miles at pace, then 2½ with him is beyond his belief at the moment. So there we are. I am now showered, have dined and am now sitting in the garden room writing this as the light slowly fades. Beyond the trees is another sunset I’ve apparently missed, but I have some satisfaction in knowing that I am getting closer and closer to my 500km target for this year. Today is my 47th birthday. I hold no qualms over telling the world my age. I feel fitter and more content than I ever have. I wake up knowing that I’m already a size smaller than I was on my 46th birthday and a heck of a lot stronger. Today was also the day I ran the furthest I’ve ever run before. My half marathon training (no, I still don’t know which half I’m training for exactly) asked for 8 miles today, regardless of the special occasion. So 8 is what I did. And because of that I’m having the best birthday I’ve had for ages! Breaking through barriers, be they just psychological, is a phenomenal feeling. Knowing that you’ve achieved something you’ve never managed before gives you that edge. That I can do anything today feeling. Welcome to planet Julie! I set off in drizzly rain, happy of the cooling benefit of the weather. I’d had to waterproof my iPhone with gaffatape to make sure that there would be no water ingress (still looking for THE all-singing all-dancing armband) but to be fair the rain lasted only for a very short part of the outward part of my run. It was nice to listen to my old ipod tunes and they kept my pace steady. I didn’t want to run at race pace. I’d not run this distance before and I needed to feel that I could finish it comfortably. I had the immediate problem of converting miles to km; Jeff Galloway wanted 8 miles but Runkeeper was in km and on my first walk break I was quickly trying to convert those 8 miles. I decided 13km would do, slightly more than 8 miles but near enough. And that meant turning back at 6.5 km. Ahem. At 7km I remembered to turn. Oops. I ran a 4:1 ratio. It meant my runs were consistent and manageable. Finishing my 8 miles in an hour and a half was right on the pace I dared to hope for. Fab! This birthday run was a great present! On returning home I decided on a cold bath. Another first. Dear God! That’s something I know I need to do in the future (instant relief) but won’t look forward to!! So there we are. Not the final frontier Jim, but boldly going where I haven’t been before! Today’s morning run wasn’t well fuelled. How do I know? Because the food I’d eaten yesterday had been converted to jelly which then replaced the bones and muscles in my legs! Jelly legs; there’s just no coming back from Jelly Leg Syndrome. It is lovely here today, bright sunshine and very little breeze. I set off with all good intentions. I knew I had a 3 mile with at least one Magic Mile in it. Jeff Galloway uses the MM to help you to gauge your race pace. You take the mile time and multiply it by 1.2 and that gives you your half-marathon pace. I picked a reasonably challenging route, the first mile at least is all up hill. I get a short downhill and then the turn around appears and I immediately have to climb that downhill. Once I get to the top I know it’s pretty much downhill all the way home. Basically I’m climbing away from sea level and then heading back down to it, usually with a sea breeze on my face and today was no exception. The first half was a killer. I just couldn’t seem to keep going at anything like a reasonable pace. At the very end of the long climb I was just about crawling, but determined not to walk until the end of my sector. I’m running this training throughout on a 3:1 run:walk ratio. Sometimes 3 minutes is a bloody long time! I tried to pick up my pace on the run home. Looking at my stats I did pretty well considering I felt rubbish. Maybe I’m being a little hard on myself. I’m heading out later with Grant to do his 5k training plan. Hopefully by then I’ll have fuelled up and be ready to rock! I’ve so far been through two covers, one had no water protection at all and the one I have now has a cover but leaves the headphone jackpoint exposed. I’ve tried all sorts, turning the phone upside down, tape etc. etc. What I need is a great cover that gives me touch screen access and keeps the phone dry. I need that reassurance. I also need my phone on my run for many reasons. It has my iPod on it. Without music to run to I can’t run at a steady pace, I tend to run out far too fast and suffer for it. Running to the beat has helped me enormously. I need it for my timing app; my stats are really important to me – I need to know what I’ve done and have a record of it (I guess that’s my obsessive nature coming through!) Most importantly, for a woman running alone out of town, I need it as a phone! I had no joy at the Apple Store in Glasgow after initially getting my hopes up seeing one cover that seemingly had the headphone entering at the bottom of the case. It was for a iTouch which has the headphone at the bottom. Damn. I’ve made enquiries about a cover I saw when reading Health and Fitness magazine. It looked as if there was a cover over the top of the top of the case. I’ll wait for my reply. Fingers crossed. The upshot of all this twining* is that as soon as the rain started, so did the treadmill. It was 8:45 by now and I decided on a 20 minute interval session. It starts off really slow and I feel as if I’m going to run off the band, but soon increases every 2 minutes until I’m running properly and then backs off for 2 minutes recovery. This is followed by 30 second climbs and then one minute back offs down to my slow jog again. After running the Galloway ratios for run:walk it’s actually nice to know that I can really run for longer than the allotted 3 or 4 minutes! This coupled with a warm up and cool down walk gave me a 30 minutes treadmill session which has left me fidgety and aching! By the time I’d finished it was well after 9pm, I still had to stretch and take in a shower before sitting down before bed. It’s just too late for me to run and I find myself uncomfortable in bed, twitchy and unrelaxed. This morning I woke feeling really tired, totally the opposite to how I feel after an earlier run. I know I’ll get better as the day goes on and I’m almost tempted to get in a short run later just to loosen everything up. We’re having a few days away in our lovely caravan, the Wobble Box as it’s affectionately known. I chose a quiet site as far west as we can go before we hit the Irish Sea, New England Bay. Here we’re about as southerly in Scotland as you can get and the tropical palms growing in every garden prove how mild the air is. 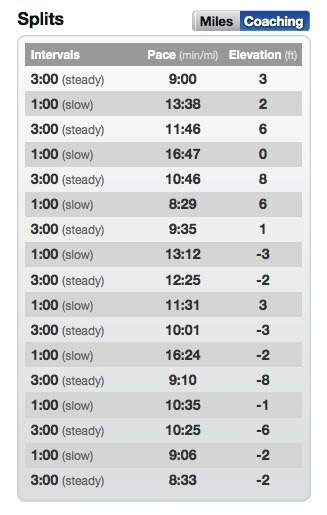 After a week of niggly knee, I was interested to see how my rested knee would hold up to a longer run. Having accidentally left my knee support at home I set off into the early evening sun for 6.5 miles. I had no idea where I was headed. The maps we have aren’t really detailed enough and my Internet signal isn’t brilliant here. Not good enough to display maps anyway. I had an idea that I could do a 3 mile loop twice and set off to do that. Going out of the campsite and turning right took me up my first hill. However at the top of it was a left turn sign posted Port Logan 1.5 miles. That’d do. The road was quiet and I only met a cyclist before heading down into the wee port. As I rounded the hill the sight that met my eyes was just idyllic. Soft sunlight glinting playfully on a near still blue sea – gorgeous. I ran through the village (past a pub with folk sitting out at tables – past it, I ran past a pub!!) and decided to try and find my way back on this road. It was a steady climb out of the village and by the time I’d reached the top I was needing a walk break. As I walked I reached a split in the road and had no idea which way to go. I’d spent a few minutes puzzling over the maps on my phone when another runner came past and shouted “Hey, how are you doing?” I had the good sense to shout back “Fine, but I’m a bit lost!” He immediately turned back and it turned out he’d followed my route from the campsite, but was on a longer run. He gave me directions and assured me that my route should give me the 6.5 miles I was looking for. His wife was also out running and I was to look out for a woman wearing a blue top. By this time I’d done 2 miles and was in my stride. 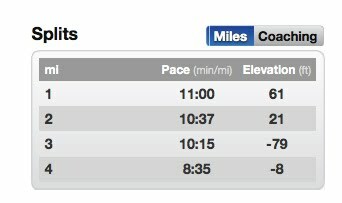 My splits were getting faster and bringing my average pace up to around a 10 minute mile, which is great for me. I hit 3 miles at 32 mins. I reached the main road again and soon could see the campsite, but with 4 miles on the clock! No way was my run up to the site going to be 2.5 miles. Something was wrong. I got to the road end with about 4.5 miles showing. I had no choice but to do some of the loop again! As I neared 5 miles I caught sight of a female runner heading towards me. We stopped and spoke. “Is your husband out running too?” I asked. “He could be” she said. I explained that I’d met a guy who’d helped me, but if it was her husband she needed to get him checked for colour blindness. As she jogged away I complimented her on her bright PINK top!! This lady had thought my route would have easily been 6 miles, but I showed her that I’d been running for 55 mins and it was showing 5.2 miles, which seemed about right. However when I carried on something strange happened. Whether my GPS caught up, or there was an App error, I don’t know but the App suddenly announced I’d done my 6.5 miles in 55 mins! Rubbish! And it also zeroed my data, the map and everything. I had no way of checking back. My only way of salvaging my run was to work it from my last known average pace which was 10:38 min/mile, a cracking pace considering I was run:walk on a 3:1 ratio! I was meant to be taking it easy and, to be honest, it felt good. I’ll do the route in the car today and consider ditching the App in favour of one that doesn’t lose all my data! Apart from data loss I’m happy. I ran well and felt strong and I’m pretty sure I completed my 6.5 miles in around 67 minutes without a murmur from my niggly knee! Post script: We drove my route in the car today and my GPS was spot on. I did my 6.5 miles, but for some reason my App stopped at 55 minutes. That’s technology for you I guess!